Tomorrow I go into hospital for an operation on my knee. It’s a very minor operation and I should be home, God willing, by the evening. But I’m aware that with all operations, there is a risk. An anesthetist may make a mistake. A patient may have a heart-attack on the operating table. An infection may set in and then escalate with fatal consequences. So as I say goodbye to my wife and children tomorrow, I shall be very conscious that it might be the last time I see them here in this world. I suppose I ought to live with that consciousness every day. We are always a step away from death. My heart could stop beating as I sit at my computer this afternoon. A drunken driver could swerve off the road and plough into me as I walk to the postbox this evening. I could die in my bed tonight and never keep my appointment at the hospital. In that sense I’m in no more danger tomorrow than I am every day of the year. But still it’s true: a visit to the hospital, like a plane journey or a serious illness does come to me as a reminder that I need to be prepared for death. Every one of us should be ready to die. I began to make my preparations many years ago. I entrusted myself, body and soul, into the care of Jesus Christ. Even as a child, I knew I was a sinner. I knew that I had wronged God. I knew that if I died, I would be lost forever. So, full of doubts and fears, I came to Jesus Christ. I put myself in his hands. I believed his simple promise, “Him that cometh to me I will in no wise cast out”. In that sense I’m prepared. But there are other preparations that need to be made, if we’re to face death calmly. I wish I could say that I’d made them all. If I were to die tomorrow, I would leave behind me a great pile of uncompleted tasks, unanswered letters, unsorted papers, a long list of people whom I planned to visit but never did: so much unfinished business. The Lord Jesus could say to his Father as death approached, “I have finished the work you gave me to do…” Paul could say, “I have fought the good fight, I have finished my course, I have kept the faith…” I wonder how many of us could use such words. But at least there is one bit of practical preparation that I have sorted out. I’ve made a will. I made my will many years ago, and I’ve kept it updated as circumstances have changed. I changed it when I got married. I changed it again when our children came along. I’ve no worries on that score. That’s a very simple but very important way in which every Christian should prepare for death. The Bible encourages us to sort out while we live the arrangements that are to be put in place after our death. King Hezekiah was told by the Lord that he needed to decide what would happen in his family after his death, and especially who would inherit the kingdom. “Set your house in order, for you shall die…” (2 Kings 20:1). King David put off the job of setting his house in order till it was almost too late. He reached a stage where he was almost completely incapable, physically and mentally, of making intelligent decisions (1 Kings 1:1-4). But he still hadn’t made his will! He hadn’t announced who should be king after him. If his wife Bathsheba hadn’t pushed him into the decision, two of his sons would have finished up at war with each other. Of course, wills were not always written down on paper. But a wise father always settled the question of who should inherit what, before he died. Jacob called his children and grandchildren before him and declared what the inheritance of each should be (Genesis ch 49). People were shocked when he announced that his younger grandson Ephraim should be put in front of Manasseh. But at least there could be no argument after Jacob’s death. God himself is portrayed in the Bible as making his will. The writer to the Hebrews (ch 12 vss 15-18) tells us that the new covenant is God’s last will and testament, made “so that those who are called may receive the promised inheritance”. And he adds that that will cannot now be changed, since Jesus has died. Let me give you some reasons why you should make a will. Reason 1: to settle what will happen to your property. Or rather, to the Lord’s property which he entrusted to you while you were in this world. Remember that: it’s his not yours. It’s your duty to make sure that while you’re here in this world, you use it in the best possible way. And as you prepare for death, it’s your duty to make sure that it will carry on being used in the best possible way: the way that will bring most glory to him. It’s a tragic fact that many Christians leave their property to people who then use it for selfish, silly or plainly wicked ends. A Christian lady dies. All her life she’s been careful to use her money wisely and well. But she leaves no will. Her estate goes to a distant cousin who’s not a believer and who will use it just for his own comfort and pleasure. Or it goes to a relative who is a Christian but who’s never learned the value of money – and who squanders it all. Wouldn’t it have been better if she had made a will and bequeathed her property for the support of evangelistic work in this country or for the relief of needy believers in the third world? We shouldn’t assume even that our own children are the best people to inherit our property. A Christian man dies. 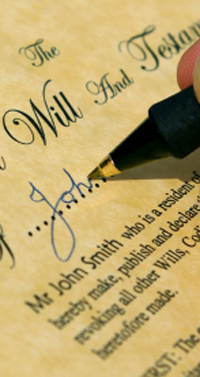 He’s never made a will so his unconverted daughter inherits his estate. She was already well off and had no need of the money. Her new found wealth may even harden her further against God. Didn’t Jesus warn that it was hard for the rich to enter the kingdom – as hard as for a camel to pass through the eye of the needle? Secure in her wealth and the status it brings her, this woman feels no need of God or his mercy. Again, wouldn’t it have been better if her father had left his property to some appropriate Christian cause? Reason 2: To avoid causing unnecessary stress for your loved ones after your death. Many people assume that they don’t need to make a will because it’s already clear where their property will go when they die. “Well, it’ll all go to my wife, won’t it?” What they forget is that the procedure that the family have to go through when there’s no will can be very complicated and very prolonged. A bereaved wife who’s struggling to come to terms with her loss, who’s trying to adjust to the new situation, who’s having to keep track of endless bits of official-looking paper, now finds that in addition, she has to jump through lots of unnecessary legal hoops before she can lay claim to what is hers by right. Surely it’s a matter of simple kindness that we avoid putting those we love through such stress and distress. Reason 3: To avoid conflicts within the family. Many families have been torn apart by bitter rows after the death of a family-member. That can happen of course, even where there’s a will. But it is far more likely where there isn’t one. Perhaps the law requires that the estate be divided between the children. But who decides how the division is to be made? “But he always promised me that I would have that…” “But the house was worth far more than that…” “But he was always giving you money while he was alive…” Again, how much better if those things are all settled in a way that no-one can challenge. Reason 4: To make proper provision for your children. I said earlier that we shouldn’t assume that our children are the best people to inherit our property. But of course, if we have young children, we do have to make provision for them in the event of our death. What if Anne and I were killed together in a car-crash? Who would look after our children? Who would we trust? Who would be willing to take on that responsibility? Would we want them to adopt our children? If we leave the estate to our children, how much freedom should the guardians have to use it for their benefit? How important is it that our children should stay together? Have you made provision for your children in the event of both yourself and your spouse dying suddenly? Can you be sure that your children would be cared for by believers? You may have made some informal arrangement with relatives or friends. But if it’s to stand up legally, it needs to be put down in black and white in your will. Reason 5: to make sure that your wishes are respected when you die. Do you want to be buried or cremated (you know my views on that one). What sort of service would you want it to be? Who do you want to take it? What wording do you want on your gravestone? These things can all be written into your will, if they’re important to you. I’ve known of instances where a believer has died, and her unconverted family have taken charge of the situation, called in a minister who knew nothing about her, knew nothing of the gospel she loved. The funeral was ghastly – a horrible travesty. I know it couldn’t harm her: she was with Christ, beyond pain or grief. But her fellow-believers here on earth were grieved, knowing that this was so far from what she would have wanted. For the record, I confess that I haven’t written my funeral arrangements into my will. But Anne knows them. I want to be buried in the Charlesworth chapel graveyard. (My place is already reserved). I want David Last to take the service. I want the undertakers to have as little to do with it as possible. I want Christian men – my friends and colleagues – to carry my body to the grave. I want Jesus Lover of my Soul to be sung. “The Lord moved my heart to write these lines that they might speak forth my mind if I should lie down in silence, if I should be taken away suddenly by the enemy or die with sickness and my senses or memory should fail me ; that then my dear and near relations, and my brethren natural and spiritual and the world may know what I was what I am and what I expect to be and enjoy; and it may be some may make but a scorn of what is writ and others slight the same; but it may be some may ponder and weigh the same and if any receive either information or comfort give the glory unto the Lord forever and ever. Amen”. He was prepared. Am I? Are you? « What is Grace Baptist Church?